@ Rich, I'm unsure of if I have a third-party clipboard installed, but I will be giving Gimp Portable a go! @ Ofnuts, I do often keep text in my clipboard as I do a lot of creative writing/typing throughout the day. I tried to copy a few small images to my clipboard and then opened Gimp with no change. Before I tried anything else, I installed Gimp Portable and it launched without a hitch! It seems to be running smoothly and doing what I need it to do (opening PSDs with groups/folders as I primarily use Photoshop Elements which can't do these things). (08-13-2017, 09:57 PM)BrassRaptor Wrote: @ Rich, I'm unsure of if I have a third-party clipboard installed, but I will be giving Gimp Portable a go! Had the exact same problem with Gimp not starting in windows 10. Same error message. I'm trying to run GIMP 2.10 on Windows 10, but it keeps crashing on startup. I tried just about everything that I could imagine (and that I found documented online), but nothing helped. 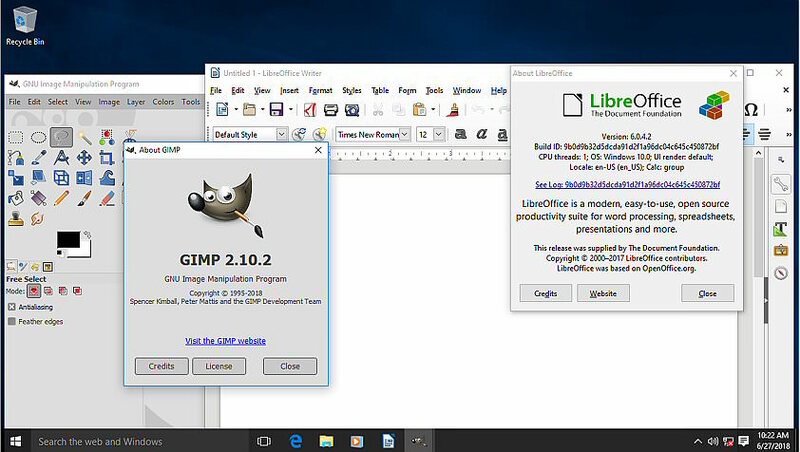 I had installed LibreOffice right after GIMP, so I thought that, perhaps, LibreOffice and GIMP don't like one another under Windows, and I decided to uninstall LibreOffice. Lo and behold! That makes GIMP work! Interesting when you delve into it. First a recommendation / possibility - The LibreOffice portable from portableapps.com I monitored an installation (only) 14421 files & 25 reg entries, a few of those files are in windows/temp and some log entries. All the rest isolated in the LOportable folder. Not surprising since it contains nothing. https://i.imgur.com/XTlLUDr.jpg I suppose the regular LO installer puts this into Windows fonts and breaks Gimp. I generally use linux and the LO 6.04 appimage. That contains many fonts which are only temporary but includes opens__.ttf looks like this https://i.imgur.com/A5UDiez.jpg So the font is OpenSymbol. After all that, using a Win10 64 bit VM and clean installations both of them default, I can not reproduce the problem. 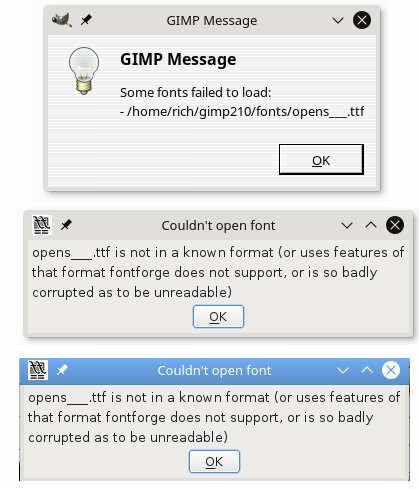 Gimp 2.10.2 starts ok. Finds the new fonts after LO installation ok. Does not crash. Installation LO then Gimp also works without any problems. Perhaps it is an issue with a Dutch language installation. Do not know. I still think a LOportable might be a good alternative. 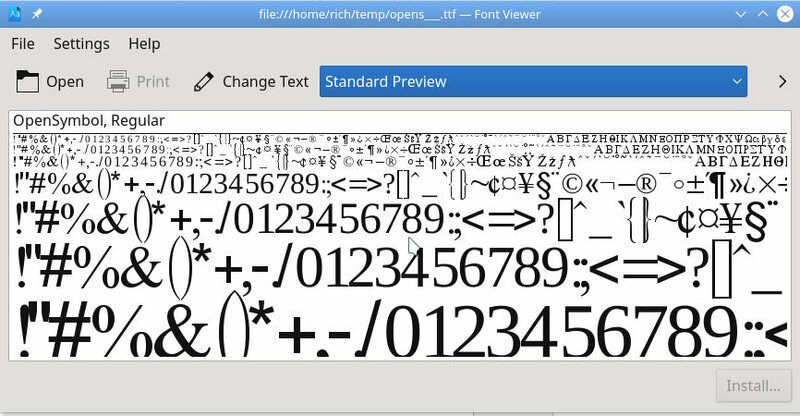 The problem was caused by the fonts that got installed by LibreOffice. 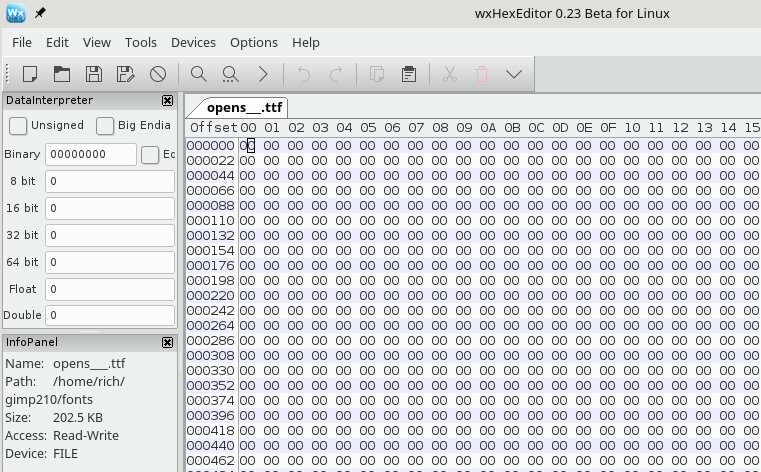 I removed the offending font files, and now GIMP works fine (as does LibreOffice). Current time: 04-21-2019, 08:51 PM Powered By MyBB, © 2002-2019 MyBB Group.